The College encourages the development of the whole person not just the academic, so we offer numerous opportunities for students to participate in co-curricular sports and activities. All sports are dependent on student participation numbers and parent volunteers. The College will endeavour to offer as many co-curricular sports and activities as possible; however, in order to ensure the viability of the activity we need committed parent volunteers who will assist with the running of each sport and activity. This can include conveners, managers, coaches and other volunteer positions. Each year Mercy Catholic College enters teams in the Northern Suburbs Netball Association Competition. The competition is played during the winter months, and fixtures commence at the beginning of April and run through to the end of August. The games are played on Saturdays at Bicentennial Park, adjacent to the Willoughby Leisure Centre. Mercy Catholic College enters teams in the well organised North West Sydney Women’s Football competition. The Football season commences in March and continues through to late August / early September. Mercy Catholic College participates in the North Shore Junior Cricket Association. Sixes Girls Cricket League. Games played across spring and summer commencing in October, Saturday Mornings. Grounds located across Northern Suburbs. NSW Schoolgirls Rugby 7s Competition which is a competition held in Term 1 and Term 4 each year. There are junior and senior divisions and we have teams in each. Mercy Catholic College enters teams in the NSBA and MWBA competitions. Training is throughout the week whilst the competition is held on various week nights during the College term at either Willoughby Leisure Centre or at the NSBA courts at Crows Nest and Warriewood for games played with MWBA. Facilitated by Fitness First Swim School, swimming is offered twice a week catering to all levels with qualified coaching at a reasonable cost. Currently it occurs on Wednesday & Thursday mornings from 7.00 am to 8.15 am at the Fitness First Gym Endeavour Street, Chatswood. Parent convenors provide supervision for students at the gym. All co – curricular Sports and Activities will require additional payment for registration fees, and may require purchase of sporting uniform, equipment etc. All fees and charges are advised prior to registration. Payment is required prior to commencement of any sport or activity and all participants All sports teams will have training sessions that all participants must attend. Transport to and from sports and activities are the responsibility of parents and students. All co-curricular activities are governed by the Colleges Code of Conduct displayed within the registration forms. We encourage students to promptly register their interest once the activity is opened as places are limited. 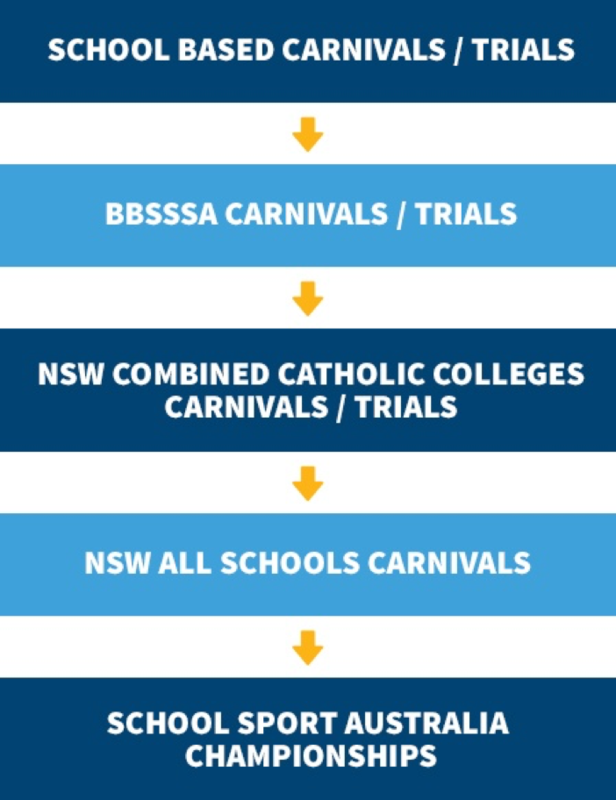 In addition to the College Co-curricular sports and activities select students have the opportunity to complete in The Broken Bay Secondary Schools Sports Association (BBSSSA). Softball, Basketball, Touch, Swimming, Soccer, Cross Country, Netball, Athletics, Surfing/Bodyboarding, Golf, Tennis, Beach Volleyball, Baseball, Biathlon (invitation only) and Surf Life Saving. to encourage and promote inter-school competition and diocesan spirit. to cater for the gifted and talented sporting students in the Diocese. to extend a sporting opportunity for students with friendly, organised inter-school competition that encourages increased participation as well as the development of excellence. to promote quality relationships amongst students, teachers, schools and the Diocese.